The U.S. Army museum sits off Waikiki Beach, between a condo complex and Fort DeRussy, in a low-lying concrete building. The helicopter on the roof and the tank out front give clues to what's inside. Mark's nephews spent the day with us yesterday. We walked along the beach to the Shorebird restaurant for lunch. We were told the waves along South Shore were supposed to be huge again yesterday like they were the day before. No such waves where we were. Instead of watching for surfers, we walked into the U.S. Army Museum. Mark made sure the boys shook his hand and thanked him for his service. We entered the exhibit area next. I tend to get claustrophobic in small, dark places, but the low ceiling of this reinforced building made me feel safe. It was built to protect, and the cool air and thick walls inside instill that "safe" feeling. I couldn't help wonder what would happen to this building if a major tsunami arrived. I think I'd run for this building, and hunker inside until danger passed. It seems much safer than trying to navigate Waikiki's traffic jams. The main hallway of the museum has displays lining the wall on the right and entrances on the left where displays of each era of Army artifacts are exhibited. I entered the first doorway. The history starts with the Hawaiian Army, not the U. S. Army. Each exhibit on the left winds around and ends up back at the main hallway, but further down from where I started. The areas are segregated by time and conflict/war. The last doorway on the left shows Vietnam. Hawaii was a place for a quick escape for R&R for the soldiers in Vietnam. Families from the mainland could catch a flight to meet their loved one in Hawaii. 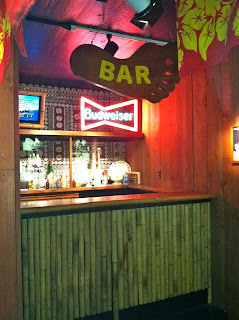 I snapped a photo of a replica Tiki Bar from the era. The TV played videos from the original Hawaii Five-0 show. 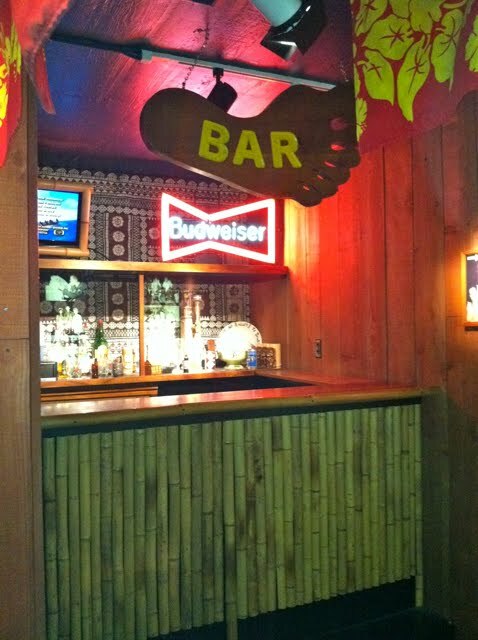 Photos of Elvis and other celebrities visiting Hawaii lined the walls of the Tiki Bar. The boys knew most of the types of guns, rocket launchers, etc. and searched for the descriptions and names of those they didn't know. They told us later they knew the names from playing the video game, "Black Ops, Call of Duty." 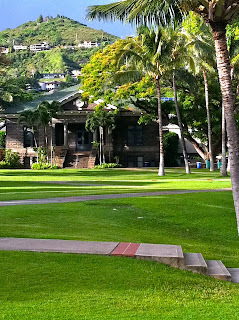 From the Museum, we walked to Lappert's Ice Cream in the Hilton Hawaiian Village. I'm not an ice cream fan, but I love Lappert's. Next we took the younger nephew to Punahou School. 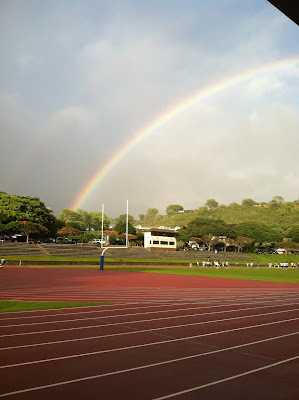 It was raining, but after we walked around campus for awhile, the rainbows broke out everywhere. Mark's nephew exclaimed, "I want to go to school here!" Who wouldn't want to go to a school with lush green vegetation, rolling lawns, large athletic pools, gyms, fields and rainbows covering the entire campus?